The whole team committed to — and accomplished — a staggering amount of work in a single sleepless day. Now it’s time to stretch, contemplate breakfast, and look back at what we created. ### Printed Collateral The print team hustled to beat their ultra-tight deadline. In spite of technical and design challenges, they produced an entire campaign that included: - Brand new branding and illustrations to match - A 8.5 X 11 poster - A 12 X 18 poster - A trifold brochure - A greeting/thank you card - Postcards The print team also produced materials to be delivered as digital files to SHCS and printed as necessary later. 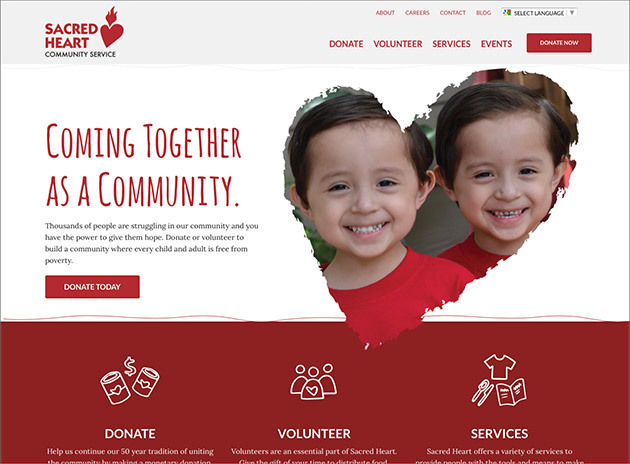 - A poster for their donation barrels - A drive kit - A promotional building banner - A sponsorship brochure ### A Website Redesign and Implementation Drawing visual inspiration from the print team, the website went from zero to launch in less than one day thanks to the tireless efforts of our web team. At least, they kept each other psyched throughout the day … and night … and next morning. Their work included: - A comprehensive content overhaul - A new custom WordPress theme - Custom fields for page headings specific to their design - A calendar/events manager ### A New Promotional Video We used existing footage and captured new shots for a public service announcement. This two-minute video promotes the upcoming holiday donation drive, calling on people to donate food or volunteer their time. It also tells the story of Erica, a current Sacred Heart Community Service employee who began her relationship with SHCS when she needed them most. 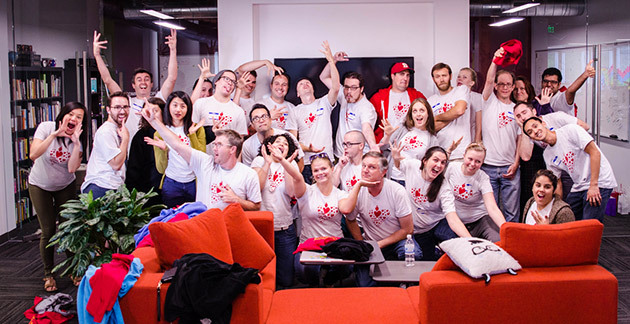 ### Thanks to our supporters More than 30 people spent the day here at ZURB World Headquarters — but we weren’t alone. We’d like to thank everyone who supported us and stopped by to cheer us on since 8AM yesterday. - **Starbucks in downtown Campbell** provided our evening coffee. - **Frost Cupcakes in Campbell** kept our sugar levels high with free confections. - **Spread Sandwiches and Armadillo Willy’s** for not only getting our orders right, but delivering on time. - **Zazzle and PrintHQ** for their expedient print services. - **Our families, friends, and especially our volunteers** who donated their time, talent, patience and — in one case — cookies. Finally, we’d like to thank the good people at Sacred Heart Community Services for making the seventh annual ZURB Wired a rousing success. New Promotional Video for Sacred Heart!!! Yes, we did it! Together with the SHCS team we created a new promotional video to energize the community and tell their powerful story. This involved some outdoor shooting, inclusion of SHSC photos, interviews with SHCS team members then music and video editing. It's a lot of work but the results are super...a must see video here!!! If this year’s theme was one of unity, no other project fit better than the new website. Designing, building and implementing the site took the combined forces of engineering, content and design — all of whom worked right from the start down to the wire to get things done. Catching up with the Teams! We just had a whirlwind of a ride going through this year's ZURB Wired, but we're not done just yet! Sacred Heart Community Service has been really great and we all are really enjoying each other's company. Overall we're wrapping it up in the QA phase. Meanwhile some of the teams that hadn't been heard got some love. Here are their stories!